BannerBuzz sells customizable display and advertising products so businesses can create awareness with their consumers. 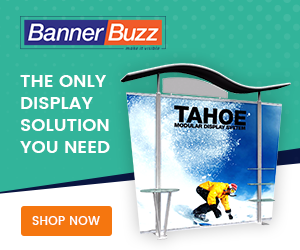 BannerBuzz.com sells over 300 different products including custom banners, signs, table display products, and marketing materials throughout the USA. All products have customizable specs and BannerBuzz’s unique design tool allows customers to create their own designs. Alternatively customers can customize from thousands of readily available templates on the website.